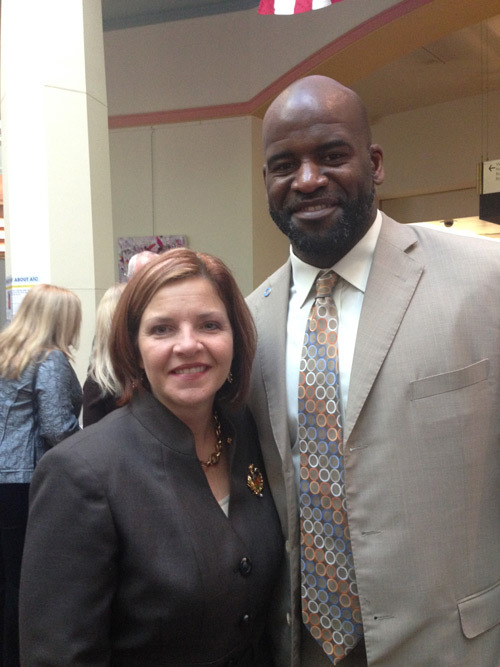 As majority chair of the Pennsylvania House Diabetes Caucus, Rep. Donna Oberlander (R-Clarion/Armstrong) commemorated Nov. 12, 2014, as World Diabetes Day at the state Capitol with this year’s keynote speaker, former Pittsburgh Steelers’ offensive lineman Kendall Simmons. Mr. Simmons was diagnosed with Type 1 diabetes during his second NFL season in 2003 and was not sure if he would be able to continue his professional football career. However, after learning to manage and cope with the disease, he flourished on the football field and went on to start all 20 games during the Pittsburgh Steelers’ Super Bowl Championship season in 2005.